Debbie Crumpet is hosting this unusual nail challenge. 2 postings a week on the last 2 weeks of the month. Basically 3 colours and for the 4 postings only these 3 colours must be used (allowances include black, white, silver, gold and glitter). 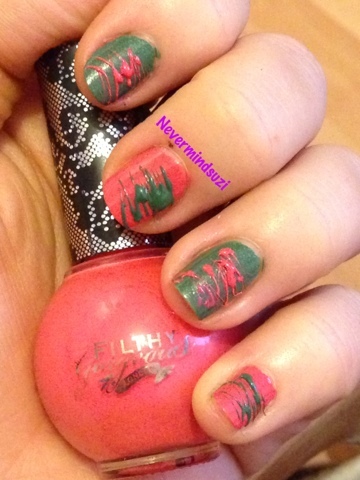 For my first challenge I've decided to do sugar spun nails. This is my first attempt at this. I think I needed bigger pools of polish but it looks ok for a first attempt. Love the polish choices :D the effect is cool too!